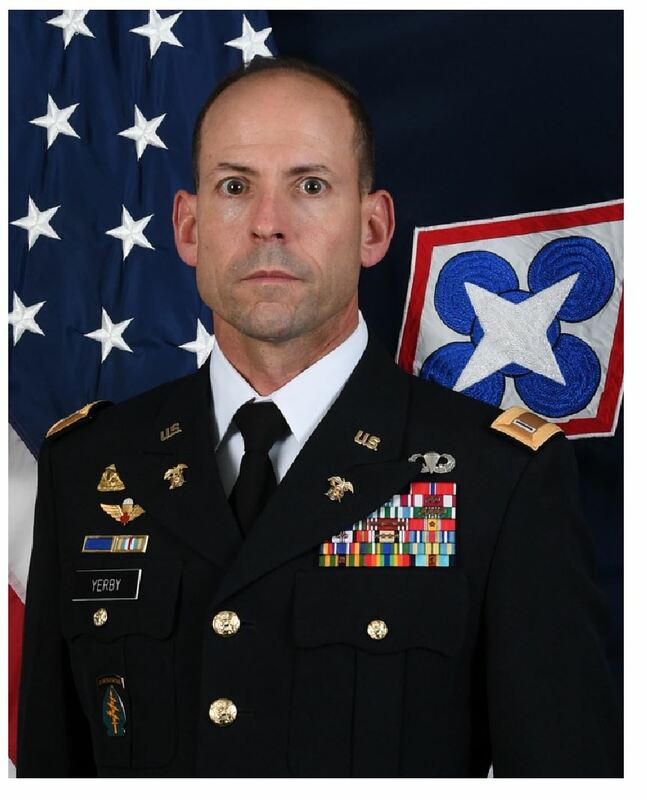 CW5 Yerby is a native of Stockton, California where he entered the United States Army in 1986 and accessed into the Warrant Officer Corps in 1994. CW5 Jonathan Yerby’s, most recent assignment was as the 14th Regimental Chief Warrant Officer of the Quartermaster Corps, Fort Lee, Virginia. His previous assignments in order of service from oldest to most recent include 5th Forward Support Battalion, 5th Infantry Division (Mechanized), Fort Polk, Louisiana; HHC I CORPS, Fort Lewis, Washington; 1st Battalion, 4th Infantry Regiment, Hohenfels, Germany; 163rd Military Intelligence Battalion (Tactical Exploitation), Fort Hood, Texas; 303rd Military Intelligence Battalion (Operations), Fort Hood, Texas; 3rd Training Support Brigade (AC/RC) Devens, Massachusetts; 194th Maintenance Battalion, Camp Humphreys, Korea; 528th Special Operations Support Battalion (Airborne), Fort Bragg, North Carolina; 3rd Special Forces Group (Airborne), Fort Bragg, North Carolina; 1st Special Forces Operational Detachment – Delta (Airborne), Fort Bragg, North Carolina; HQ, United States Army Special Operations Command (Airborne), G4 (Sensitive Activities), Fort Bragg, North Carolina; 401st Army Field Support Brigade, Camp Arifjan, Kuwait. While in these assignments, Chief Warrant Officer Five Yerby served as a Unit Supply Clerk, Unit Armorer, Supply Sergeant, squad leader, platoon sergeant, Battalion S4, Brigade S4, Task Force J4, Troop Commander, Property Book Officer at Battalion, Brigade, Group and Theater level, Brigade Senior Warrant Officer Advisor, Staff Officer, Chief of Policy and Compliance, Command Property Accountability Technician and Regimental Chief Warrant Officer of the Quartermaster Corps. CW5 Yerby’s education includes: Primary Leadership Development Course, Basic Noncommissioned Officer Course, Standard Property Book System - Redesigned, Warrant Officer Candidate School, Warrant Officer Basic Course for Property Book Technician, Airborne School, Department of Defense Emergency Preparedness Course, Warrant Officer Advanced Course, Department of Defense High Risk Survival Course, Warrant Officer Staff Course, Warrant Officer Senior Staff Course. Senior Leader Seminar. He holds an associate’s degree in General Studies from Pierce College, Washington. CW5 Yerby’s awards include the Bronze Star Medal, Defense Meritorious Service Medal (1 OLC), Meritorious Service Medal (3 OLC), Joint Service Commendation Medal, Army Commendation Medal (4 OLC), Army Achievement Medal (2 OLC), Joint Meritorious Unit Award, Good Conduct Medal (#2), National Defense Service Medal (2 OLC), Southwest Asia Service Medal (2 Stars), Afghanistan Campaign Medal, Iraq Campaign Meritorious Service Medal, Global War on Terrorism Expeditionary Medal, Global War on Terrorism Service Medal, Army Service Ribbon, Overseas Service Ribbon (#3), Military Outstanding Volunteer Service Medal, Honorable Order of Saint Martin, Parachutist Badge.